Billy was assigned to Charlie Troop and accompanied them to Vietnam in August of 1965. Billy was a Crew Chief on an UH-1B helicopter gunship. Billy’s’ Helicopter was shot down with WO Billy Talley, McCrory, Arkansas, WO Benedicto Bayron, Waianae, Hawaii and SGT James Riley, Vienna, West Virginia. All four men died. Walt Titchenell related the following story to me: The night before the crash, Billy Knight, James Riley, Louis Walton and he sat in their make shift shelter. They drank a little Rice Wine and with Louis Walton playing the guitar they sang songs like “There was a Frog on a log on the bottom of the sea”. Finally Billy said they had to stop because it was very late and he and James had a first light flight. It took 10 days before they could get to the men and retrieve their bodies. But as always, their bodies were sent home so the families could give them a proper burial. 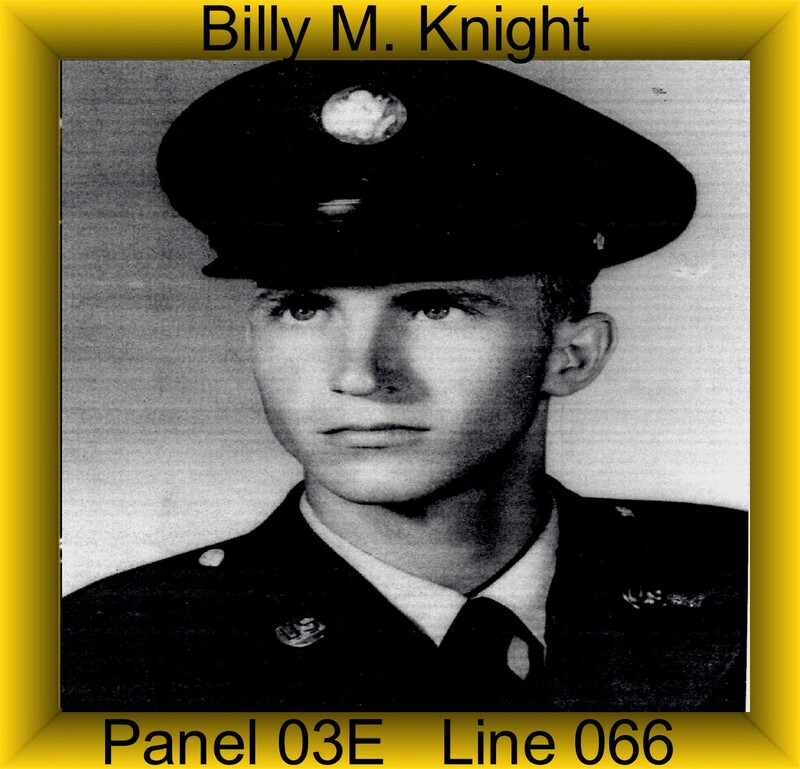 Billy was awarded the Purple Heart, the National Defense Service Medal, the Vietnam Campaign Medal and the Vietnam Service Medal. On September 29, 2016, Mrs Ruth Knight Brenner widow of Billy Knight, Ruth Knight Brenner Donaldson, daughter of Billy Knight and Billy Brenner, son of Billy Knight attended the 2016 Charlie Troop Reunion and met some of the men who served with their husband or father. It was a great night for the Knights and all of Charlie Troop 1st Squadron 9th Cavalry Regiment. Billy Brenner gave me the picture of his father that is posted on here. Judy related a story to us about the Yellow Rose. My wife started the tradition of giving a yellow rose to the wives of the men being honored that year and to our Gold Star Family Members. Judy said that before her Dad joined the Army they were very poor. Her Dad could not afford to buy a Red Rose for his wife for special occasions so he would buy her a yellow rose instead. So when she was handed that yellow rose she could see her Dad standing there hand it to her. I did not know your dad but there are several men in the Association I belong to who knew your dad well. I can put you in touch with them if you wish. You can send me your phone number to pcbnamin@verizon.net and I will have them call you. I wish I had a picture of your dad either from Vietnam or maybe with your mom or when he was younger. Do you remember your dad? I am trying to find someone in the family to write something about him as a human being and not as a soldier. I try to show each of these brave men as a human being as well as a soldier.